This weeks theme at Gothic Challenge is “Text”…our hostess is Gillian Hamilton who has created this beautiful arch using all different types of text. To see more of Gillian’s work you can visit her blog: http://gillianhamilton.blogspot.com. What do you think of when creating art with text? Love letters? song lyrics? a favorite quote? We hope to see your amazing creatings here this week! Hi everyone, what a thrill to be this weeks hostess for GA 🙂 Thank you Nancy for this lovely honour. so a little bit about me, lets see, I live on the eastern coast of Australia, I am happily Married to my husband Andrew and happily Mothering my three children. 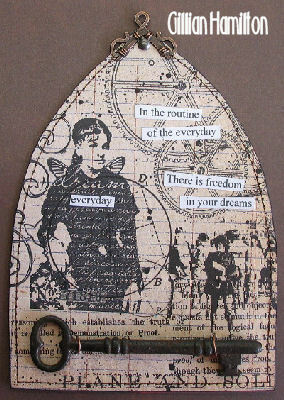 I spend as much time as possible creating, I love collage style art, and combining unusual ‘found’ items into my work. I really hope you enjoy creating with this weeks theme of Text, I love using text in most of my pieces and I can’t wait to see what you create. Wonderful theme. Here is mine. Thanks for looking. I love books, letters, text, fonts.. Great theme!! Here’s my entry! love the subject. here’s my entry. Thanks Gillian – here is mine. oooooooooops don’t know what i did there!!!! That’s my entry and I hope that I did not make “irrelevant”. I chose to illustrate a quotation, an Arabic proverb which says : ” what is spent ran away ; what you hope is absent ; but the present belongs to you”. TFL ! Here’s my Text arch-thanks for looking! Another exhilarating theme! Here’s my entry. To leave a comment click on the thumbnail on the left. Thanks! Here’s my wintry arch. Thanks again to Cora for generously sharing her images. Here is my text entry for this week. Here’s my entry for this week!!! Sorry I am late but have been entertaining guests…Here is my Arch…. This is my first Gothic Arch Card i enjoyed doing it and i hope you like it. thanks thor this gereat theme! Thanks for all these greats ideas!!!! Here is my entry, just in time this week!! I’m happy!!!! Thanks for this great challenge. Here is my first entry. Here’s my entry for this week, lovely challenge!